Class and culture collide in Dallas to offer you an exciting array of possibilities for your wedding day photography session. Let the city and its history provide the backdrop for your photos as you celebrate this momentous day! 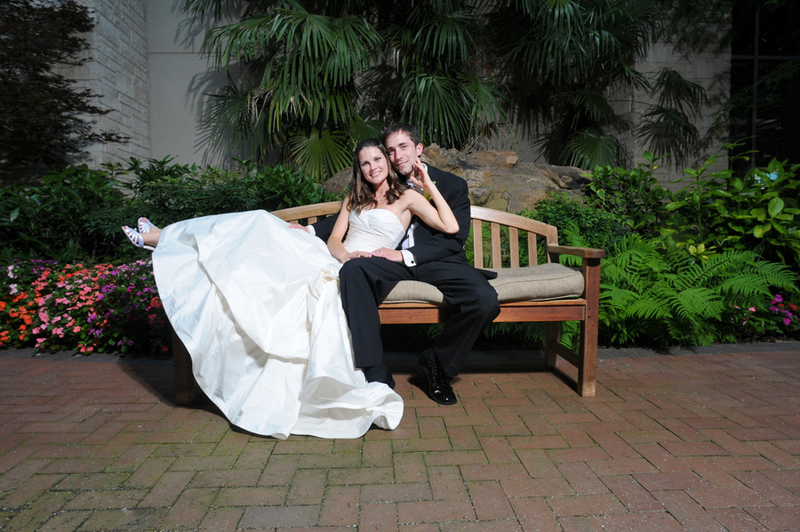 Begin your wedding day photography itinerary in classic western style at Pioneer Plaza in the heart of downtown Dallas. Located by the Dallas Convention center at the intersection of South Griffin and Young Streets, Pioneer Plaza represents a stunning intersection of history and natural landscaping in the midst of urban industry. Designed by local artist Robert Summers, this plaza boasts bronze statues of many longhorn cattle and three cowboys commemorating the pioneering trails that first founded Dallas. As the largest open public space in the central business district, Pioneer Plaza provides the ideal place to begin wedding day photography for the inherently Dallas couple. Have your photographer arrange several shots of the entire group amidst the statues in the foreground and the Dallas cityscape in the background. Capture the history and western character of the city as your wedding party poses in several arrangements. After this have your photographer seclude the bride and groom to create a few more serene poses near the flowing stream and waterfall that punctuate the plaza. After capturing the western bravery and aura of Pioneer Plaza, move next to the Morton H. Meyerson Symphony Center in downtown, home to the Dallas Symphony Orchestra. Seamlessly blending modernity of architecture with the grandeur of music, this stunning structure offers an ideal contrast for your wedding day photography. Begin this stop on your itinerary with several shots of the bride and groom alone beneath the beams overarching the entrance. Let the vaulted glass walls form a beautiful backdrop to your private poses. Then bring the entire group into the shot while having your photographer arrange graceful bridal party poses against the impressive architecture. Glide into the lobby to capture a few shots with the afternoon light filtering in through the glass. Use the height of the walls and the effect of the light to your advantage as you arrange several group poses with the lobby’s dramatic balcony behind you. Your wedding day photo itinerary will now bring you to a setting dominated by the nature and wildness that characterizes elements of Dallas. Cedar Ridge Preserve on Mountain Creek Parkway offers an amazing opportunity for photography against an untamed background of Texas nature. The rock and dirt footpaths are the perfect chance to whip out those cowboy and cowgirl boots for classic Dallas wedding shots. The contrast of western flair against the refinement of your wedding attire is priceless. Have your photographer arrange several group shots with one of many ponds in the background, making sure to capture the beauty of wildflowers should your wedding fall within the spring and summer months. After photographing the entire wedding party, bride and groom will journey with the photographer up to the Escarpment Nature Preserve for a few solo poses a the highest point in the Dallas area. For the next stop along your wedding day photo itinerary you’ll journey beyond the formal limits of Dallas to embrace perhaps one of the most truly iconic Dallas locations: the Dallas Cowboys Stadium. Officially located in Arlington and launched in May 2009, this pristine new stadium embodies the classic sport inherent to the character of both Dallas and Texas. For the sports enthusiast couple, this is a must for your wedding day photos. Bring your photographer and wedding party to the stadium’s entrance and arrange several fun filled, whimsical shots with the stadium in the background. Let your enthusiasm for Dallas and for this legendary team set the tone for your pictures as you and your wedding party take advantage of this location for some less serious poses. After several group shots, have your photographer capture the bride and groom alone beneath this stunning new entrance. 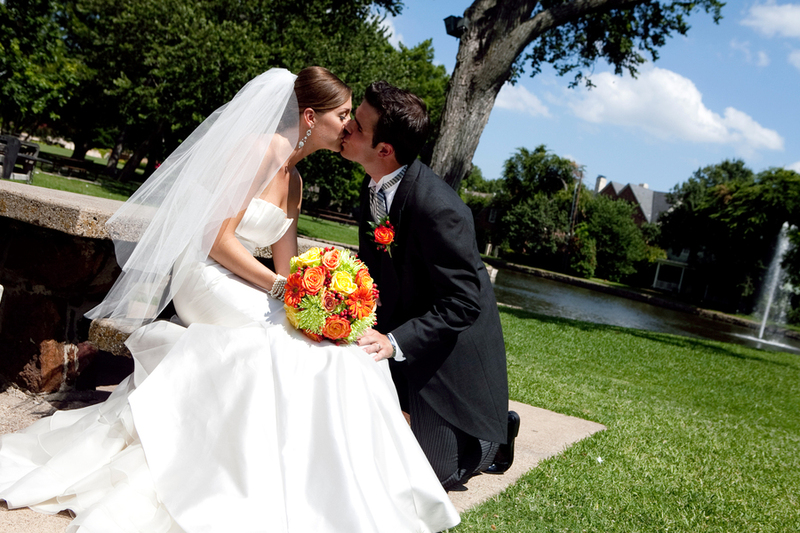 Your final stop along your wedding photo itinerary will be Lone Star Park at Grand Prairie, the horseracing center of Dallas. Evocative of the western spirit and competitive streak innate to all Dallas locals, this location offers beautiful photography opportunities that truly root your wedding day in Dallas culture. Arrange several poses of your entire group in the circular walkway that welcomes you to the entrance of the park. Have your photographer shoot several photos with the stately clubhouse in the background, making sure to include the flowers and landscaping closer to the group. Then move closer to the clubhouse façade, taking advantage of the elegant arches that comprise the formal entrance. After capturing a few shots of the entire wedding party, conclude this segment of your photo session with several poses of the newlyweds alone beneath the central archway.